There are many myths about Chabad. Like the one that Chabad invented Jewish outreach. Don’t believe a word of it. Chabad never did outreach. The term is antithetical to everything that Chabad and the Rebbe stand for. You call them “distant”?! What gives you the right to say that you are close and they are far? You must approach each one of them as though you are the King’s servant sent with a message to His most precious child! “No what?” the Rebbe responded, as though in shock. “No Jewish background,” was the hesitant response. “Tell them that they have a background! Their background is that they are children of Abraham, Isaac and Jacob!” the Rebbe replied. So I don’t believe that the Rebbe preached outreach, and Chabad, from what I’ve seen, doesn’t practice it. Sure, the word gets used, but there are days I think we should ban it. We don’t need any more distinctions between Jews. We certainly don’t need to divide ourselves between those who are on the inside and those who are on the outside. 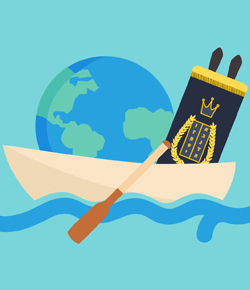 In Chabad, there is one Jewish people, all of us in the same inside of the same boat. So what do we practice? What is a Chabad House? What is the mitzvah campaign? What are all these beards and black hats, sheitels and long skirts doing in the most bizarre places, if not outreach? Quite simply, we are patching up the boat. The soul of the mitzvah campaign is ahavat Yisrael—love of the Jewish people. And the meaning of that love is that we are all one. That’s why there was never a campaign that was meant only for “them out there.” Every campaign encompassed and embraced the entire Jewish people. When there was a tefillin campaign, not only did we run out on the streets to roll up sleeves and apply the “Jewish blood pressure test”—we took our own tefillin to a scribe to be checked as well. When the Rebbe initiated the mezuzah campaign, he made sure to discover a cranny of his own office that could use a new mezuzah as well. When he started a campaign to have a charity box in every Jewish home, he started personally handing out dimes and dollars to children and grownups to give to charity. So, if a Chabad House is not an outreach center, what is it? Chabad is an idea. An idea that is valid no matter where you are and who you think you are. It wasn’t invented yesterday, and it’s not going away tomorrow. It is the idea that every person has to use his own mind to awaken his heart and connect with his G‑dly soul. A Chabad House is a place that facilitates that. For anybody who wants to make that connection. So why are we “out there”? Why do we make such a big deal of traveling to the furthest reaches of the world, as long as another Jew might be found there? Aren’t there enough Jews to take care of in Brooklyn and Jerusalem? Because this is the mandate given us in our time, to “spread the wellsprings to the outside.” As the Rebbe pointed out, not that the water from the wellsprings should spread to the outside. That would be outreach. The wellsprings themselves should be outside. The “outside” should become wellsprings. Every single one of us, without distinction. There’s a Jew somewhere in the world who imagines he’s “out there.” He doesn’t find in himself—if he ever stops to look for it—any connection left with his people. Maybe he’s far away on the globe, maybe further in ways of life, ways of thinking. In Chabad, every reach reaches deeper within. What do you mean, "we all" are "children of Abraham, Isaac, and Jacob"? That's like saying we all are children of King Tut, or we all are children of Gilgamesh. We all are children of Adam and Eve, and of Noah, but we are not all children of Shem. Some are children of Ham. Some are children of Japheth. And not all the children of Shem are also children of Isaac and Jacob. Not all the children of Abraham are children of Isaac. some are children of Ishmael. Not all the children of Isaac are children of Jacob. Some are children of Esau. Kiruv Rechokim Interesting to point out that the Rambam in hilchos teshuva clearly states that before one does teshuva he is called "rochoik" etc. Find an orthodox Sephardic (Ladino) congregation. Or even an Ashkenazi congregation. Attend services. Ask to be invited to Shabbat dinner at people's homes. If you like the people, ask the rabbi how you can be a Jew, if that is your desire. It will take a year (or more) to learn enough to be even an ignorant Jew. I was trained in eating kosher from earliest infancy. I saw how my mother kept her dairy dishes and pots and pans and food in separate cabinets from the meat utensils. Learning as an adult is hard. If the rabbi turns you away, go a second and a third time. It is customary to test people's sincerity and stamina by turning them away three times. It is hard to live as a Jew. Jews NEED a great deal of sincerity and stamina to endure. For us all Chabad was there for me when I returned. I'll always be thankful to the Rebbe and Chabad for that. Outreach But, what about someone who wasn't born as a Jewish, but somehow yearns and loves the Torah? Confused This entire article confused my view on how I viewed Chabad/shlichus since I was born (I am a FFB Lubavitcher). Since I was young I was told "chabad is outreach, you reach out to people and give them the happiness of living a Yiddishkeit life to them" "You teach them, and reach out to them", etc. For me, that's not outreach -that's nothing less than sharing the beauty of Torah and the beauty of the world G-d has given us!